I have a new poem. This Saturday I'll be reading 3 poems. '2018', '2019', and 'Aging'. I wrote Aging a couple days and it still needs a little fine-tuning. All of the poems fit into the theme of "Formula For the Future". 'Aging' explores a few very personal concepts of 'the future'. 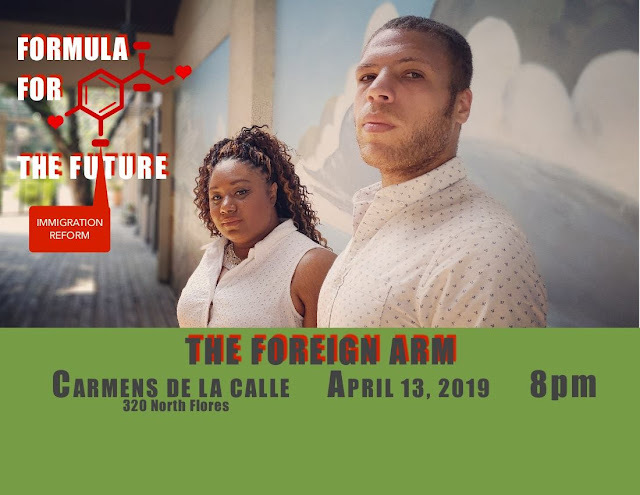 I'm excited that I'll be performing alongside a couple of amazing poets (Naomi Sumthin' To Say and George Lee) and The Foreign Arm on April 13, 2019, in downtown San Antonio at Carmens De La Calle. This is one of my favorite locations in town. There's another amazing poet in the line up of the band. Andrea Vocab Sanderson is not just a great poet but a great leader. You can check out one of my psst readings at Carmen's with Vocab below. Watch The Foreign Arm on KSAT below.